New Delhi, India -- Last week the Dalai Lama said, “I knew a Tibetan monk for a long time. He was taken away to a Chinese gulag and kept there for 18 years. When he was released he fled to India, along with other Tibetans, for refuge”. He continued calmly, “I met him and asked him about his experiences in prison”. The monk replied, “At times I was in great danger”. “What kind of danger?” asked the Dalai Lama. “I was in danger of losing my compassion towards my Chinese captors”, he replied. 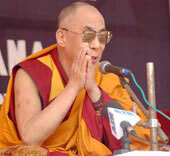 “Now, that”, spoke the Dalai Lama, “is Buddhism”. I am not a believer in organised religion, but spent three days with the Dalai Lama learning first-hand some of the teachings of Buddhism. They are worthy of sharing as we enter the New Year searching for that elusive element — peace. The Dalai Lama talks in simple and child-like ways, interspersed with his own laughter. He chortles as he explains: “I am fed up of formality, I have had too much of it since my childhood”. Indeed as head of Tibet in exile and as the head of the Buddhist religion he has had his share of ceremony. Yet, he also remains a living propagator of an age-old philosophy of non-violence, or as a frail man in loin cloth called it earlier, satyagraha. How do you deal with an ‘enemy’, someone who actually has inflicted pain upon you, asked someone. If you think the workshop was attended by believers, think again; in rapt attendance were foreign secretary, Shankar Menon, former foreign secretary Shyam Saran, now handling the Indo-US nuclear deal, Nasscom head Kiran Karnik and other movers and shakers of society. “Your enemy”, replied the Dalai Lama to all listening, “becomes an object for you to practise compassion. It is easy to practise compassion on those you love, but the enemy becomes an object for you to further your practice”. In the age of globalisation, as success (read the ability to buy) is hyped and marketed as the exclusive road to happiness, the Dalai Lama spoke of a few simple truths. First, the concept of interdependence; the intrinsic unity of all things. The newspaper you are reading was once a tree, which was once a seed, which was once... 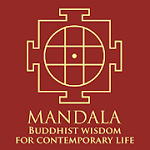 In Buddhism there is no beginning and no end. It does not believe in a creator God, but that the Buddha was a human being who attained enlightenment. “It is possible for us to walk that path”, said the Dalai Lama. But you must practise compassion for all sentient beings, with altruism, that will bring you inner happiness. Peaceful ways of conflict resolution have to be found, otherwise we start a spiral of resentment and then violence. The death sentence, as in the case of Saddam Hussein, perpetuates a cycle of violence. India’s freedom struggle had many strands, but Gandhi’s non-violence captured everyone’s imagination. Today’s satyagrahis are Aruna Roy with her right to information and now right to food campaign, Medha Patkar with the cause of displaced people and Ela Bhatt who has organised women casual labourers and vegetable vendors into a selfemployed trade union. 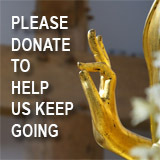 Aung San Suu Kyi, another practising Buddhist, has said: “I have no ill-feeling towards my captors, only compassion”. Perhaps that is what has kept her going these 10 years while under house arrest. Burma’s first democratically elected prime minister, U Nu, ousted by the military coup in 1962, was put into prison. Later in exile in India, this practising Buddhist along with Jawaharlal Nehru promoted the concept of Panchsheel and the non-aligned movement. Non-violence in the hands of a political leader can have a wave-like effect, but in the hands of individuals it can lead to a sense of well-being and peace in the family and workplace. At the end of the three-day workshop, the Dalai Lama presented each individual with a white scarf, and gave his blessings. The event was extensively photographed, but conspicuously missing was foreign secretary Menon. Perhaps it was the one photograph the Chinese government, as it further strengthens its stranglehold over Tibet, would not like to see.